This is the type of book that I wish WotC would release for every one of their card sets. 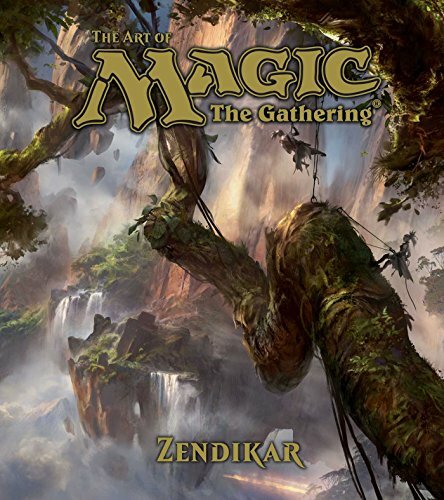 The Art of Magic: the Gathering: Zendikar is a 240-page hardcover that collects the artworks and lore of Zendikar, Worldwake, Rise of the Eldrazi and Battle for Zendikar. The book is huge and the paper quality is excellent. The artworks and colour reproduction are fantastic. For the price of the book, it's really a bargain. This is actually an illustrated compendium with all the backstories that tie the cards together. Instead of reading short excerpts from the cards, you can now delve into the history of races, lands and the magic. Instead of the small artworks you see on the cards, you can now view them huge, some are printed across two pages. The artworks are breathtaking and easily the highlight of the book for me. The amount of details in each artwork is amazing and now you get to see them in beautiful detail. If they are printed out as prints, many deserve to be in museums. I also like that each artwork is credited to the artist so you can look them up online. For fans of Magic, this is almost a must buy. It's also highly recommended to those buying it just for the art. It's fantasy art at its best.